Buy only whole beans and grind only what you brew immediately. Grind with a Burr or conical grinder, as it doesn’t heat up the beans as regular blade grinders do (it’s considered 're-roasting' the beans.) A Kona coffee ground up too fine for a regular drip filter or French Press may not taste different from your no-name office brew! You may even end up with bitter, acidic, or weak, even sour tasting coffee. It all has to do with the flow rate of the water around the ground up fragments: Large coffee particles have less surface area than small grounds, so they extract more slowly. Slow extraction is the key to a great Kona coffee! The small grounds will over extract. That's as far as I bother you with the physics. The brewed coffee from high quality, correctly processed 100% Kona beans will be clearer to the eye, appearing like a thick honey color. Because of having few to none impurities, it’ll produce a sweet balanced cup with good acidity, quality and rich aromatic flavors. You'll be surprised to find out that you need less ground coffee per cup than with other coffees. The rule of thumb is that 1 lb of Kona beans will produce about 45 cups of poured coffee - you'll do the math to find out how affordable this cup of luxury then suddenly becomes! Buying packaged ground coffee is comparable to pre-slicing a cake into pieces many days before serving it: The cake would quickly become stale and the frosting would dry out. 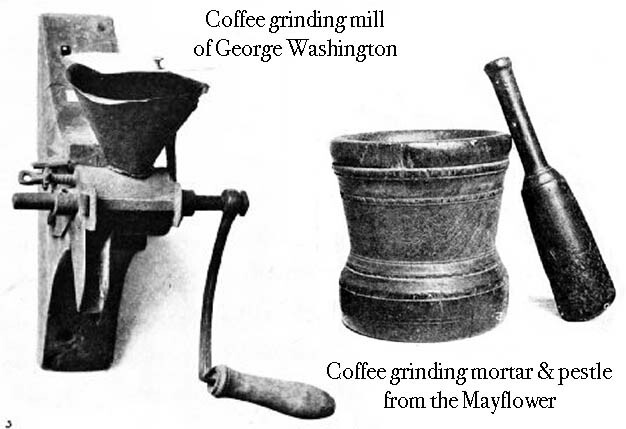 Grinding coffee breaks up the beans’ fibers and exposes their aromatic oils to oxygen, which inevitably results in a less or even stale taste. So grind only what you need. Moisture, oxygen, sun light, and high temperatures are enemies of roasted coffee. Store your beans away from the aforementioned hostile forces and you will preserve the Kona coffee’s freshness & flavors much longer. 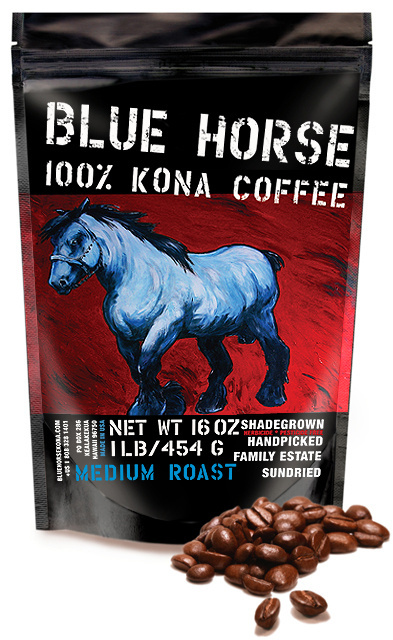 An airtight container or the zip locked bag BLUE HORSE KONA comes in, stored in a cool, dry, dark place is the best way for keeping it at its best. Avoid putting it where sunlight might warm it up too much. The porous structure of the coffee beans may absorb the flavor of stored seafood (yikes!) as well as the moisture produced by the freezer. Moisture deteriorates coffee quickly and all its delicate aroma notes. Remember, the beans released their essential oils during the roasting process and natural sugars caramelized to give the coffee its fine layered flavors. Freezing breaks down these now volatile oils and their scents get removed. 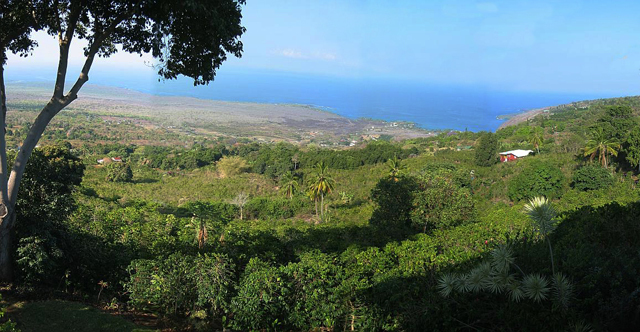 A premium Kona coffee, roasted and packaged properly, stays fresh for weeks, even months. We tested our coffee, unopened and stored properly after 6 months and barely noted any loss in aromas. Yet we recommend to use up BLUE HORSE KONA within 2-3 months of the purchase date. That said, the freezer can be an acceptable place to store coffee in case you bought several pounds at a time. Yet once taken out, please don’t put it back in again, as the constant changes in temperature will ruin it quickly. Never refrigerate coffee. If coffee would taste any better or keep fresher when refrigerated, many gourmet stores would present their coffees that way, right? Vacuum-sealed coffee doesn’t equal the freshest coffee, because once coffee is roasted it releases CO2 for days afterward: Hence it has to ‘sit’ around for a while before it will be "sealed for freshness”, or it may burst the bag. Fresh-roasted coffee is packaged right away in our valve-sealed bags which allow the gasses to escape and avoid oxygen to get back in. 1. Buy single estate, whole beans, farm direct - not blended from various sources. 2. Look for valve-sealed bags, not just vacuum-sealed. 3. Store your coffee beans in a sealed container or zip locked bag in a dark, cool place. 4. Grind the beans just before brewing. Use a Burr grinder. 5. Brew it in your regular coffee maker of French Press, but use a bit less coffee than you are used to. 7. Remaining brewed coffee makes deliciously iced coffee later on in the day. 8. Use any old coffee grounds for fertilizing your potted plants or flower beds.